In the Light of What We Know is a novel teeming with ideas and stories. It is filled with conversations about mathematics, politics, religion, philosophy, which makes it sound intimidating. Instead, it is thought-provoking and absorbing. The nameless narrator is an American of Pakistani descent and privileged upbringing. When the novel opens in 2008, he has been fired from his position as an investment banker and is separated from his wife. At his door appears an old friend from his school days, a man he hasn’t heard from in years. Zafar was born in Bangladesh and raised in poverty in London. But he made his way to a degree in mathematics at Oxford, becoming first an investment banker and then a human rights lawyer. Zafar has been adrift, though, and the narrator barely recognizes him when he arrives. 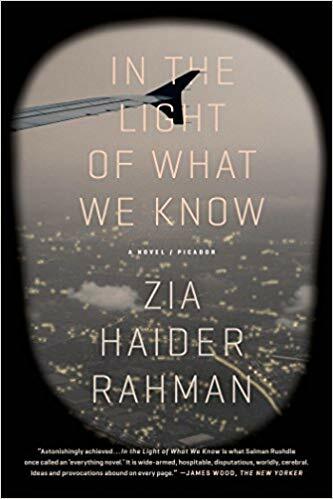 Although the narrator has occasional remarks to make, most of the novel is Zafar telling about his life in anecdotes and ideas that wander and are loosely connected. Gradually, then, we understand the events that trouble and particularly anger him. All along there are hints of a massive disclosure. Occasionally, when involved in the many circumlocutions and digressions in this novel, I felt myself on the verge of irritation, but I never actually entered into it. Instead, I found it fascinating. This novel is about exile, the feeling of not belonging, and so much more. It pins itself on the story of an unhappy love affair and on deception in the wake of 9/11. It also has something to say about the financial collapse, the war between Pakistan and Bangladesh (which I didn’t know about), Afghanistan, and many other subjects. The title is ironic, because Zafar has a fascination with Gödel’s Theorum, which says that there are things in mathematics that are true but cannot be proven to be true. The novel is about truth, knowledge, and belief. What are they, and how do they interact? This is a novel I read for my James Tait Black Fiction Prize project. I like the sound of this a lot. Digressions can be annoying but it sounds like these are handled well. Yes, all in all, I felt it was an interesting, absorbing book.